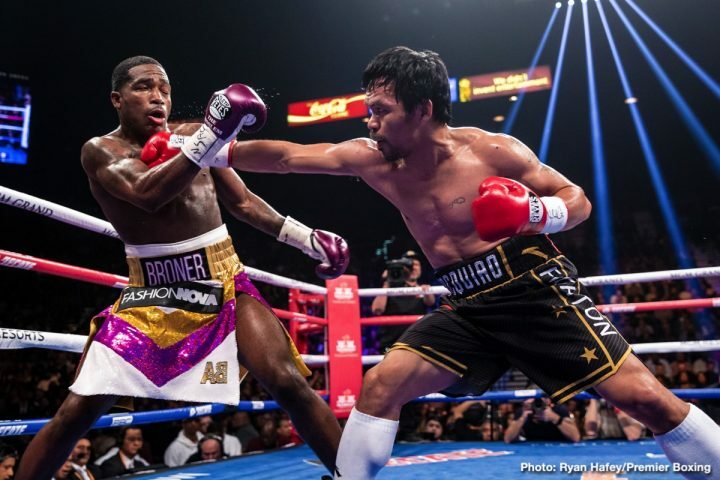 By Mike Smith: Jeff Mayweather says Adrien Broner only came to just survive against WBA ‘regular’ welterweight champion Manny Pacquiao (61-7-2, 39 KOs) last Saturday night in their fight at the MGM Grand in Las Vegas, Nevada. Mayweather says he found it hard to give the former four division world champion Adrien even one round in against Manny. Jeff saw the fight as a rout from start to finish. Jeff notes that Broner landed just two hard punches during the entire fight, and that wasn’t enough to give him to personally give him any rounds. The judges were more than fair in scoring it 117-111 [nine rounds to three], 116-112 and 116-112 [eight rounds to four] in favor of Pacquiao. Broner didn’t look like he won 4 or even 3 rounds. He looked like he was shutout by Pacquiao. Of course, Broner is a popular fighter, and it would have looked bad on the judges’ part if they gave the 40-year-old Pacquiao a wide decision victory with him being given all 12 rounds on the scorecards. The loss for Broner could spell the end of his career as a main event fighter. This was Broner’s third big fight in the last two years, and it was the third time he under-performed by not throwing punches. Broner made the 40-year-old Pacquiao look sensational, which he might not have if he’d fought one of the lions in the 147 pound division last Saturday night like Errol Spence Jr., Keith Thurman, Terence Crawford, Shawn Porter or Danny Garcia. It looked to some boxing fans like Broner (33-4-1, 24 KOs) just came to get a pay check. He wasn’t engaging, and he didn’t have any marks on his face afterwards. Broner bragged at the post-fight news conference last Saturday night, that his face was completely unmarked. What Broner didn’t admit is that he wasn’t fighting aggressively, and he was just hanging back, not throwing punches. “I think one guy came to fight, and the other guy came to survive,” Jeff Mayweather said to Fighthype in criticizing Broner’s performance against Pacquiao. “It’s the same thing everybody has been saying [about Broner]. He needs to throw punches. This was the first time you really saw Broner use his legs. In most fights, he don’t use his legs. He tries to walk everybody down. If he’s going to incorporate that into his game and he’s going to move forward with his career, it would be better for him. I think he’d be a better fighter if he’d use his legs when he fights, as opposed to just using them tonight because he needed them,” Jeff said. It was good to see Broner, 29, using his legs to move around the ring for once in his career. However, the negative thing about that was Broner looked like he was just running from Pacquiao, and not using his legs to try and win. The movement that Broner used, isn’t going to help him win against the top guys at 140 or 147. Broner needs to throw a lot more punches. That was the main reason why Broner lost last Saturday to Pacquiao. He wasn’t letting his hands go win the rounds the way he needed to. “It looked like he came to survive. He didn’t come to fight, not at all,” Mayweather said. “I saw two or three solid right hands, which is probably what he was banking on, the right hand counter. In a fight as big as this magnitude, you’ve got to let your hands go. It’s the same thing everybody has been saying about Broner. I know the difference between a guy that is trying to win, and a guy that is trying to survive,” Jeff said. It’s anyone’s guess why Broner didn’t adapt early on when he fell behind against Pacquiao in the early going. Broner’s corner needed to let him now that his punch output needed to increase significantly for him to have a chance of winning the fight, but he failed to do so. Broner fought with no inspiration in the way he needed to, treating this fight with Pacquiao the same way he did in his previous match against Jessie Vargas last year in April. There was no motivation on Broner’s part. He had talked before the fight about how excited he was at getting a dream fight against Pacquiao. Everything was supposed to be different in this match than it had in the past for Broner, but it wasn’t. Nothing changed. He fought in the same reserved manner that he had during most of his career, which suggests that he’s not physically capable of throwing more punches even if he wanted to. It could be a stamina issue on Broner’s part, or perhaps a problem with his willingness to take punishment. When a fighter decides that he’s going to throw more punches, it means he’s going to get hit a lot more. Look Gennady Golovkin. He gets hit a lot in his fights while going for knockouts, but he’s been willing to take punishment in order to dish out his own. “As soon as the fight is over, they’re going to talk s—t, and that’s it,” Jeff said in addressing the comments Broner was saying after the fight by him saying that he should have won. Broner failing to admit that he lost the fight was a new tactic by him. In Broner’s previous losses to Marcos Maidana, Shawn Porter and Mikey Garcia, he hadn’t complained about the losses. He admitted that he’d been beaten by them. Pacquiao beat Broner more decisively than three fighters. Broner had his moments against Mikey, Maidana and Porter. But against Pacquiao, Broner was completely dominated from start to finish. “To be honest, I had a hard time giving him [Broner] even one round, because he didn’t do nothing,” Jeff said. “I mean, you can’t even give a guy one round if all he did was land one good punch. That’s what he did. In the fight, he landed two good right hands, and that was it. Nothing else. Even when you counter, you’re still at risk. He didn’t want to take any chances. He caught Manny a couple of times, but he didn’t follow up with it,” Mayweather said. Giving Broner one round would be a gift some respects, because even in his best round, which was the fourth, he was badly outworked by Pacquiao. Broner landed a couple of good shots to the head of Pacquiao, but the round was one-sided just like the rest of them. Broner clearly wants to fight like Floyd Mayweather Jr., who was known for having a low punch output. Mayweather was successful because his defense was so good. It would help him cover up for his low punch output. Broner has the same low punch output Mayweather has, but his defense is nowhere near as good. As such, Broner gets hit a lot, and he ends up getting outworked by his opponents. Broner should have fixed this defect in his game by increasing his punch output a long time ago, but he’s failed to do so. That’s why Broner keeps losing, and why he’ll continue to lose far into the future unless he fixes this glaring problem with his game. Broner’s low punch output is even worse than Mayweather’s though. There were no rounds in which Broner landed even 10 punches during the entire 12 round fight against Pacquiao. Mayweather could at least be counted on to land 20 punches per round in his fights. Broner was struggling to land just 5 per round. Broner connected on only 50 punches for the entire fight against the easy to hit Pacquiao. There are welterweights in the division today that can connect on 50 punches during a single round. Broner landing only 50 punches in an entire 12 round fight against Pacquiao last Saturday night was embarrassing and troubling at the same time. Broner is 29-years-old now, and it’s unlikely that he’s going to improve much at this point in his career. Smart fighters are able to make corrections to their game to continue to improve during their entire careers, no matter how old they are, but Broner hasn’t proven he can do this.